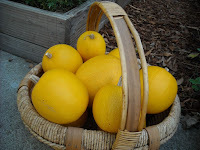 Today I harvested the rest of the spaghetti squash, all 27.9 lbs of it. I have now officially grown over 100 pounds of produce. 120 lbs and 7 oz's to be exact. What gorgeous squash! And YAY for breaking the 100 pound mark!! Good for you! That display of hanging squash is quite impressive, I must say. Especially since you didn't sling them. Did they not put a kink in the vine from the weight? EG - Thanks. No kinks in the vines from what I could see. The vines seem to be nice and strong. 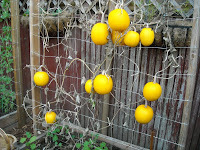 I only had two squash drop off and that was after the vines died off. They look like happy halloween lanterns. Love 'em! Now they sitting in a basket outside, by my front door. They look so very nice.